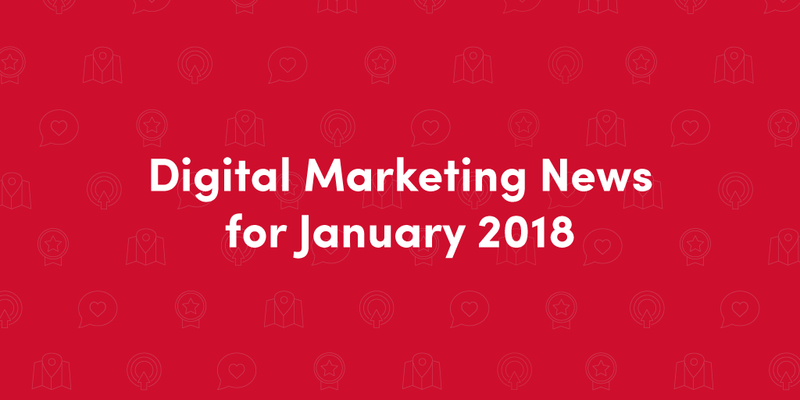 Hello and welcome to your digital marketing news roundup for January 2018! This is a new thing we’re doing to keep you up-to-date with all the news and trends that will affect your business each month. January 2018 has been a huge month for digital marketing news, especially from Google! This roundup will focus on the most important changes and announcements we’ve seen from the search giant this month. From a big announcement about mobile load times to review extensions leaving AdWords, we’ve got a lot to cover. 1. Google announced that page speed will be a mobile ranking factor starting in July 2018. On January 17, Google published a blog post that announced its “Speed Update,” stating that although page speed has been a ranking factor on desktop, mobile is now the focus. This shouldn’t come as a surprise since mobile usage has surpassed desktop, and we’re living in a mobile-first world. The “Speed Update” will only affect pages that are extremely slow to load on mobile devices, but you should still check your website’s mobile experience. Studies have shown that if your website takes more than three seconds to load, the user will leave and look for another business. Here's a blog post about optimizing your website for mobile. 2. You can now add videos to your Google My Business profile. Google was testing this for a while, but now the option is available to all Google My Business users. You can upload and manage videos in your Google My Business profile. Customers can also upload any videos they’ve made, but you’ll still have some control over this. You’ll be able to flag inappropriate videos right in your Google My Business Dashboard. The videos will show up in the photo section of your Google listing. Videos can give people an inside look at your business and highlight your products, services, promotions, etc. So, this is a great place to add videos of what your business looks like, you interacting with customers, an employee performing a service you provide (changing oil, putting on false eyelashes, cleaning a carpet, painting a house, whatever it is that you do). Here's a blog post about getting started with video marketing. 3. Google is removing review extensions from AdWords ads. Review extensions are a text ad extension that allowed advertisers feature reviews in your AdWords ads. These extensions have been notoriously difficult to get approved, and Google is finally getting rid of them. Starting in February 2018, review extensions will be deleted. You won’t be able to see any data about their performance, either (unless you save it before the info is gone). We know that online reviews will continue to be a crucial part of your local business’s marketing strategy, so you should still be working on getting new, positive reviews as well as replying to reviews. Don’t forget that we have a review marketing platform that helps you get more reviews and shares them across your social media and your microsite. Here's a blog post about building a better review marketing strategy. There were other notable changes this month, including a Facebook algorithm update that we’ll talk about next month, so stay tuned. In the meantime, check out our blog for more digital marketing tips and trends.